In the thirtieth year, in the fourth month of the fifth day, the heavens were opened and I saw visions of God. As a Renaissance artist Raphael (1483-1520) sought to combine Greek and Roman traditions with those of the Bible. His understanding of Yahweh was therefore influenced by the representation of the Roman god Jupiter. This highlights the problem any artist has in trying to portray God - every attempt is bound to be biased and partial, reflecting the conventions and assumptions of a particular time and place. We may feel that these sometimes come between us and God rather than enhancing our understanding. What Raphael does here is to use every resource at his command to reinforce the sense of glory of the divine majesty. Ezekiel was one of the Jewish people taken captive and living as exiles in Babylon. There he had a series of visions in which the heavens were opened, and which form the basis of much subsequent understanding of the divine nature (including the book of Revelation). In this first vision an immense cloud in a windstorm was surrounded with brilliant light. The centre was like a fire. There were four living creatures - an ox, a lion, an eagle and a man. A voice spoke to Ezekiel, calling him to a mission to his people. The power of the vision was such that Ezekiel never deviated from this calling. Raphael has been careful both to study the biblical narrative in his picture and to adapt it in such a way that enhances the coherence and unity of his work. 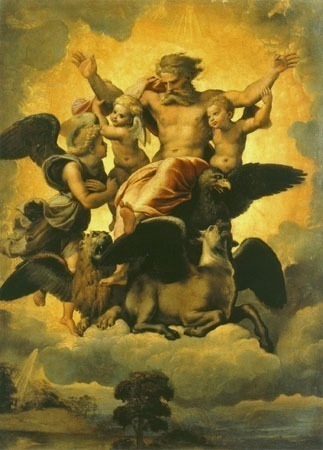 God moves above the firmament supported by playful cherubim and the four creatures (the 'tetramorph', later identified as the four evangelists). The six creatures together with the central figure (who represents God) form an almost perfect whole, solid yet moving and with spaces in their togetherness. The colours representing the glory of God are accentuated by the sombre surrounding clouds and silhouetted wings, while the spaces between the interwoven figures provide the opportunity for that glory to shine through. The realism of the figures and their skin colours means that the whole is dominated by the yellow and gold of divinity. 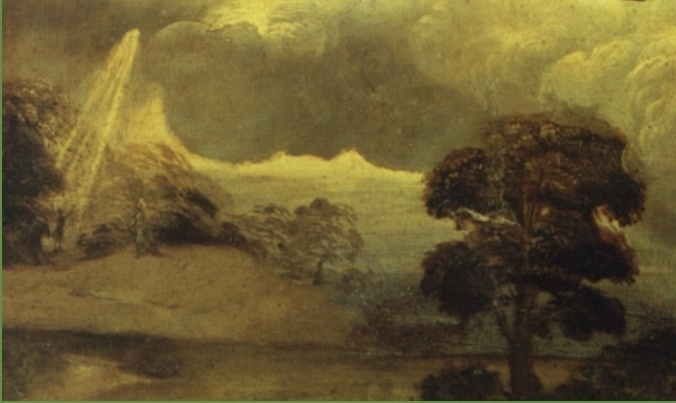 The eyes of the divine representation in this vision focus on the diminutive figure of Ezekiel at the bottom left-hand corner of the picture. The contrasts of scale could hardly be greater without Ezekiel disappearing completely! The shaft of light in which he is caught is part of a landscape which is separate from the vision. It is as if there are two realities, a heavenly and earthly, linked only by that beam of light. In this way Raphael underlines his awareness that it is a vision, not an historical event: real and overwhelming to us and to Ezekiel, but one to which many of Ezekiel's hearers are blind. It is possible that Raphael's depiction of this vision has done as much as the written word for many to convey the essence of the divine glory. Raphael: Vision of Ezekiel, c.1518, oil on panel, 40 x 30 cm. Uffizi, Florence. Biblical Background: Ezekiel 1:1-14; Ezekiel 10:14 and Revelation 4:6-8. Raphael or Raffaello Sanzio da Urbino (1483-1520) was an Italian painter and architect of the High Renaissance. His work is admired for its clarity of form and ease of composition. Like Michelangelo and Leonardo da Vinci he was one of the great masters of that period. Raphael was enormously productive, running an unusually large workshop, and despite his death at 37 a large body of his work remains. Many of his works are found in the Apostolic Palace of The Vatican. His best known work is The School of Athens in the Vatican Stanza della Segnatura. He was extremely influential in his lifetime and after. Keith J. White is the leader of Mill Grove, a Christian residential community that has been caring for children and young people in the East End of London UK since 1899. His first degree was in English at Oxford University, and he has retained a love for literature, music and art “to the greater glory of God.” He has written or edited a long list of books, among them The Changing Face of Child Care; The Art of Faith; and Now and Next. He led the team that produced a new international Bible (The Bible Narrative and Illustrated, 2008) designed for those outside the church and Christian faith. This incorporates 500 illustrations into the overall design. Keith teaches the theological foundations module of Holistic Child Development at Malaysia Baptist Theological Seminary in Penang, Malaysia. He also contributes to conferences, symposia and publications around the world. He is an Associate Lecturer at Spurgeons College, and a member of the faculty of the Asian Graduate School of Theology.